giveaway, Paisley, tea, Tea Co.
Great news! The generous folks at Paisley Tea Co. have offered two of my readers the opportunity to each win 2 boxes of their delicious tea! To enter, just leave a comment on this post stating your favorite summertime drink. I'll choose the winners on Sept. 4 and they'll be contacted to let me know their mailing addresses. Sorry, due to postage costs, this giveaway is only open to the US. Also, for everyone who orders tea from the Paisley Tea Co.'s website the code "angloaddict" will give you 20 percent off boxes of Paisley! The code is good through Sept. 16, 2012. Don't miss this opportunity to save on this delicious, all organic, fair trade English style tea! Once you try it, you'll be hooked! 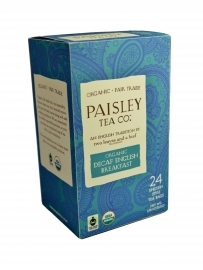 Thanks to the Paisley Tea Co. for offering this great prize, and good luck! I love iced tea in the summer. I just adore iced tea with lemon, over lots of ice, of course! Diet coke in the fridge with a squeeze of fresh lemon and ice! I love ice cold water with a slice of lemon. I do love Southern sweet tea but this summer I've been addicted to Coconut Water! I love iced tea with sugar! I love brewed Tea with Fresh Mint over ice on a hot summer's day! I like lemonade and iced tea. I love sweet iced tea! I love ice tea in the summer. I love southern sweet tea. I love fresh squeezed lemonade. I love iced tea with lemon. I love love love peach iced tea! I love Iced Tea with Lemon!! My favorite summertime drink is sun tea with fresh lemon. I like iced tea, with lemon. I love unsweetened ice tea in the summer...it's so refreshing! I love Sweet Tea with lemon in a ice cold glass with ice cubes. lots of Black Tea I just love that! My favorite drink is diet green tea!